This entry was posted in Uncategorized and tagged announcements, book tour, cover art, discounts, Dreamspinner Press, male male romance, paranormal, promo, sale, Sarah Madison, The Sixth Sense Series, Unspeakable Words, upcoming release by Sarah Madison. Bookmark the permalink. 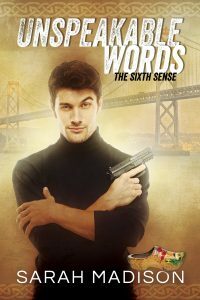 Sarah Madison recently posted..Unspeakable Words and all my titles on sale at Dreamspinner Press!